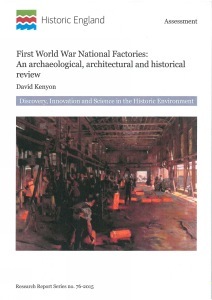 The First World War National Factories were under the direct control of the Ministry of Munitions producing vital war material, everything from wooden boxes, respirators, shells, and explosives to optical glass and vehicle radiators. Many were adapted from existing works, while others were located in specially designed factories. Some were finished to high architectural standards and followed the latest thinking in factory design and the provision of welfare facilities. In some instances associated housing was included. The report discusses the historic context of the National Factories, the types of factories created, their layouts and architectural form. It also explores their social history, including evidence for the organisation of work, welfare provision and, briefly, associated housing. It documents each factory and includes short desk-based assessments of the extant factories, which may be used to recommend better levels of protection, raise public awareness, enhance management information, and identify any significant and undesignated sites as well as knowledge and protection gaps.